Vargas Plateau Regional Park may not be the largest or most spectacular park in the Bay Area, but it certainly is one of the most controversial. During the mid-1990's, the park district spent millions of dollars purchasing the parcels that were to make up the park. After much time and effort, the park finally opened in the spring of 2016, only to be closed two months later due to a lawsuit filed by two neighbors concerned about traffic and parking on Vargas Road and Morrison Canyon Road. After several additional improvements to the roads, the park was finally reopened on May 15, 2017. 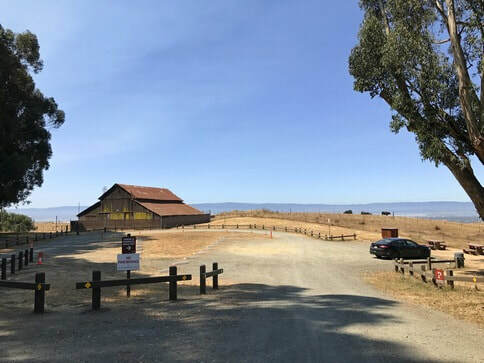 As part of the whole lawsuit hullabaloo, any references to using Morrison Canyon Road as an access to the park have been removed from the directions and park maps, and notices have been put on the park map reading "No Park Access From Mission Blvd" and "The Park is Accessible Only From the I-680 Vargas Road Exit." On the contrary, the park actually is easily accessed from Mission Blvd in Fremont, and we tell you how to do this in The Dirt section below. 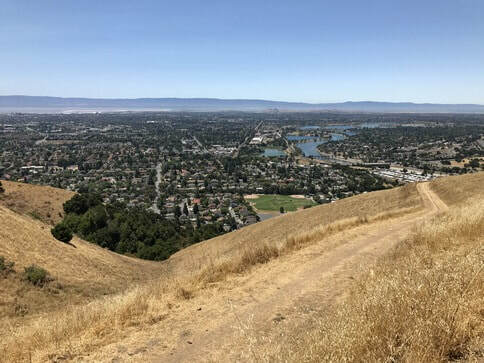 The 1,249-acre Vargas Plateau Regional Park contains about six miles of trails which offer tremendous views of the East Bay cities to the west and Niles Canyon and Sunol Peak to the east. Elevations in the park range from about 100' at the lower Morrison Canyon Road entrance to 1188' at the high point and lookout. From the lower entrance, the trail climbs steeply and gains over 800' in just one mile. The trails in the park are old ranch roads which offer excellent views but no shade, so a hot summer day is not the best time to visit. Also, there is no drinking water in the park, so you'd better bring your own! ​Click here for a printable map of the Favorite Run Below! Click here for the official park site with trail map. Click here for driving directions to the official staging area. The public is encouraged to use this entrance, located near the high point of the park. There is a lower entrance to the park located along Morrison Canyon Road about one-half mile east of Mission Blvd. There is no public parking lot, but there is room for about 10 cars along Canyon Heights Drive just off of Morrison Canyon Road. From there, it's only 0.2 miles up Morrison Canyon Road to the entrance gate. Click here for driving directions to the parking on Canyon Heights Drive. Dogs are allowed, and may be off-leash away from trailheads, parking lots, and areas marked as on-leash only. Refer to the East Bay Regional Park page on Dogs for more information. This route takes you from the lowest point in the park (around 100') to the high point at just under 1200'. The first mile is fairly flat, followed by a steep one-mile climb up to the plateau. After a rolling loop, you visit the high point of the park for a panoramic view of the Bay Area. The last few miles are mostly downhill back to the start. The run starts from the intersection of Morrison Canyon Road and Canyon Heights Drive in Fremont and enters the park through the lower Morrison Canyon Road entrance. There is street parking available on Canyon Heights Drive. 0.0 mi: From Canyon Heights Drive, turn left onto Morrison Canyon Road and start running up the side of the road. 0.2 mi: Turn left through the well-marked gate for Vargas Plateau Regional Park to get on the Cliff Trail. 0.7 mi: Veer right to stay on the Cliff Trail. The trail now climbs almost 800' in about one mile. 2.0 mi: Pass the unmarked trail on your left and continue straight onto Deer Gulch Trail. 2.9 mi: Turn left onto Upper Ranch Trail. 3.2 mi: Cross over the gravel driveway and veer slightly left to continue on Upper Ranch Trail loop. This 1.7-mile loop will take you to the back side of the park, descend past a greenish pond, then climb back to this spot. 4.9 mi: Turn right onto the gravel road to climb to the high point. 5.0 mi: At the 1188' high point! Enjoy the view of the Bay Area and then turn around. 5.1 mi: Continue straight on the gravel road. 5.2 mi: Veer right back onto the Upper Ranch Trail. From this point, you will retrace your steps back to the start. 5.5 mi: Turn right back onto Deer Gulch Trail. 6.4 mi: Continue back onto the Cliff Trail and begin the steep descent. 8.2 mi: Exit the gate and turn right back onto Morrison Canyon Road. 8.4 mi: Back at your car!